Why Choose Gentle Dentist in Trappe and Collegeville, PA for Dental Implants? The Gentle Dentist, centrally located in the Collegeville, PA area, specializes in dental implants. We understand there are many providers who offer a wide range of pricing and choices, and it can be confusing. Dr. Geetha Srinivasan and Dr. John Foore take a comprehensive approach and evaluate your dental health before making any dental implant recommendations. We use top rated BioHorizons® dental implants. We offer a one-stop office for dental implants, including mini dental implants and all on four dental implants. 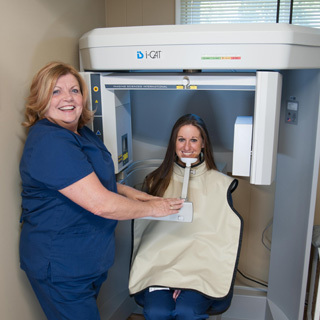 We perform any necessary X-rays, CT scans, cleanings, fillings, crowns and other services in the same office. Call The Gentle Dentist at 610-489-9005 to schedule your free consultation today. We prioritize your comfort and ensure your care is as painless as possible. Dr. Geetha Srinivasan is one of the select dentists in Pennsylvania who is board certified in conscious IV sedation. An expert in her field, Dr. Geetha Srinivasan completed a Dental Implant Fellowship from the ICOI International Congress of Oral Implantologists. We offer comprehensive dental care, which means you receive treatment in one location, rather than coordinating appointments with multiple offices. We base your treatment plan on your dental health, not a manufacturer’s quota for dental implants. If a crown or bridge would serve your needs better than a dental implant, we will tell you. For patients who are price shopping for dental implants, it can be a challenge to compare costs because each provider offers different levels of service and uses different implant brands. The Gentle Dentist is one of the few dental implant providers in the Collegeville, Trappe PA area to offer 3D printing for dental implants. The 3D rendering is more precise, more efficient and cost effective. This advanced 3D rendering technology eliminates costly pre-op work and helps us create super precise, custom temporaries for optimum healing and comfort. We accept many dental insurance plans including Cigna, Aetna, Guardian, Delta Dental, MetLife and United Concordia. We also offer financing and payment plans. Please call our office to learn more. Are dental implants right for you? Call our office and schedule a free consultation. We use top quality BioHorizon dental implants and state-of-the-art iCAT® CT technology. With The Gentle Dentist’s comprehensive dental care, you receive treatment in one location. We are honest. If a crown or bridge would serve your needs better than a dental implant, we will tell you. Dr. Geetha Srinivasan is one of the select dentists in Pennsylvania who is board certified in conscious IV sedation. We want to make you smile. One of the most gratifying moments as a dentist is seeing a patient’s improved dental health and self confidence. If you are suffering because of missing teeth, please call our office for a free consultation. Tooth loss decreases your ability to chew properly, affects your nutritional diet and alters your smile. Even more damaging, tooth loss leads to bone loss. A missing tooth causes the jawbone beneath it to shrink and become brittle due to lack of exercise. A missing tooth also changes the shape of your face, making you look older. The benefits of dental implants include replacing missing teeth, maintaining bone, keeping your youthful appearance and restoring your natural smile. Tooth loss due to tooth decay, gum disease or injury is very common. In years past, bridges and dentures were the only available treatment options for tooth loss. Today, advances in dental technology have made dental implants an effective treatment for missing teeth. Dental implants provide a strong foundation for fixed or removable replacement teeth. The replacement teeth are made to match your natural teeth, restoring your smile. This versatile tooth loss treatment is easy to tailor to your unique needs, offering the options of replacing one tooth, multiple teeth or all teeth. Our Gentle Dentist team is specially trained and experienced in oral surgery and restorative dentistry. We will evaluate your specific needs and develop an individualized treatment plan that is best for you. To start, a small post made of titanium called the tooth root implant is placed into the bone socket of the missing tooth. The jawbone heals and grows around the implanted metal post, anchoring it securely in the jaw. The healing process can take three to six months. Once the healing is complete, the Gentle Dentist team makes impressions of your teeth and creates a model of your bite. We use this unique information to create a new tooth for you. The replacement tooth, called a crown, is then attached to the abutment. The replacement tooth will look, feel and function just like your natural teeth.